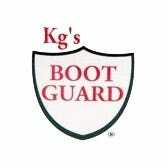 KG's Boot Guard works like a toolbox for your boots. Made in the USA, KG's is waterproof, nonflammable and made for leather, Cordura, rubber, vinyl. . .heck, you can even put it on exposed steel. Apply a single coat; two hours later, another coat is applied. After the boots have dried overnight, they'll be covered with an invisible guard that won't crack or flake off to make your boots look shabby. What it will do is protect boots from wear and tear, strengthen seams to prevent water and chemical damage and even help guard against stray sparks. KG's Boot Guard was first created in a Wisconsin shoe and boot repair shop, by people who saw a problem and figured out a way to fix it. That's the true spirit of American innovation, and the heart of KG's Boot Guard.